Prior to World Ducati Week (WDW) the Italian firm had already revealed that they would use their 90th anniversary celebrations at last weekend’s festival to unveil two new models. While one was to be an anniversary edition of their flagship Panigale, the other was shrouded in mystery, and Ducati insisted that the only people to see the new bike would be those in attendance at Misano – which topped an impressive 81,000 attendees over the three days. Ducati have been revealing bikes at WDW since 2014 when the firm hid their worst kept secret, the Scrambler, in a private viewing area and allowed showgoers into the private enclave to feast their eyes on it well ahead of its official unveiling. Unfortunately for Ducati, someone always manages to sneak a camera in, unmasking the private treat to the whole world. It happened with the Scrambler, and it happened again this weekend with the new SuperSport. A useful image has emerged, and while no-one seems sure who took the photograph, is has now been shared on forums and websites all over the world. Project 1312, as the SuperSport is currently known (the thirteenth project bike started in 2012), is more likely to be called the 939 SuperSport and 939 SuperSport S when the two models arrive in UK Ducati dealers next year. Ducati have confirmed that there will be two models at the launch, the SuperSport, and SuperSport S. While this is interesting in itself, the next obvious question has to be whether the range will then expand in capacity in both directions. The firm use the 821 engine in the Monster (on which the chassis architecture of the SS is based), and of course there’s also a 1200 in use. Visually the wheels appear near-identical to the standard 1299 Panigale, with three Y-shaped spokes on the front and single-sided swingarm. The bike in the box was fitted with Pirelli Diablo Rosso II rubber, which seems likely to be the production choice, as they fit the bike’s design brief. The front is a 120/70 ZR17, the rear a 180/60 ZR17. The bike shown at WDW was the SuperSport S, which boasts a spangly array of Öhlins front and rear. Neither end features any electronic assistance, in line with the bike’s ethos as an uncomplicated, road-focused sportsbike. The standard model won’t get Öhlins, but will still be fully adjustable, and is likely to be Sachs – as used on Ducati’s Monster 821 Stripe. The engine is based on the Hypermotard 939’s Testastretta 11º liquid-cooled L-twin. 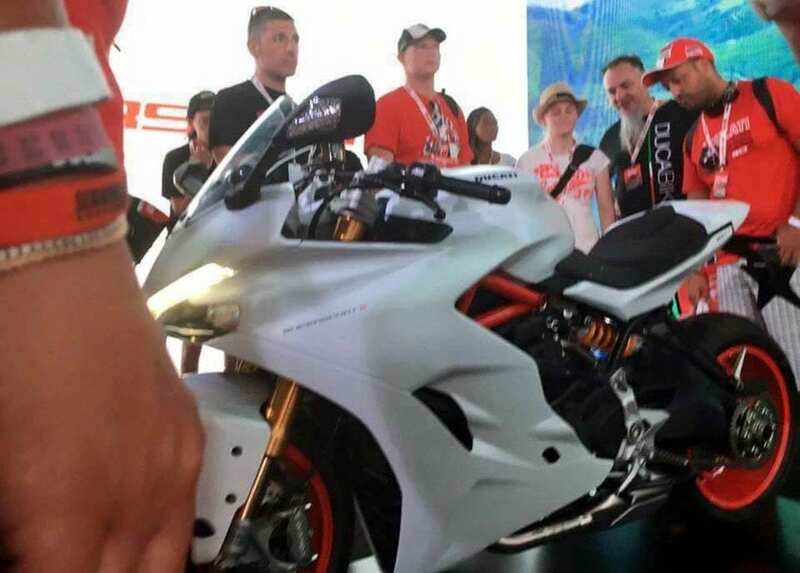 Actually 937cc, the engine has been heavily modified – Ducati say 80% has changed – to make is suitable for the new SuperSport, and it will develop around 110bhp. There’s no word yet on any other engines being considered to form a range, but previous SuperSport families have included engines from 400cc to 1000cc. The front set-up looks to comprise two 320mm semi-floating discs, gripped by radial Brembo M4.32 monoblock four-piston calipers, activated by a radial pump with the required ABS as standard. We can’t see the rear set-up, but it’s most likely to be a 245 mm disc, with a twin-piston caliper and ABS. It seems highly likely for a road-focused sportsbike that the brakes will be identical between the two models. Every new bike from 2017 onwards is required to have ABS, but the SuperSport goes much further with its rider aids. The two models will benefit from three modes – Sport, Touring and Urban – which will be linked to Ducati’s eight-level traction control. While this is intended as a pure road sportsbike, this level of rider modes and electronic assists now appears to be the expected minimum standard. There’s no hiding the SuperSport’s visual referencing of the Panigale family – but Quattrino was keen to stress that this isn’t part of the Panigale range. This is nothing new – the similarities are redolent of the Supersport family of the late-80s/early-90s, when the SS range strongly mimicked the 851/888 superbikes, but offered a much cheaper, more relaxed and lower-powered riding experience.